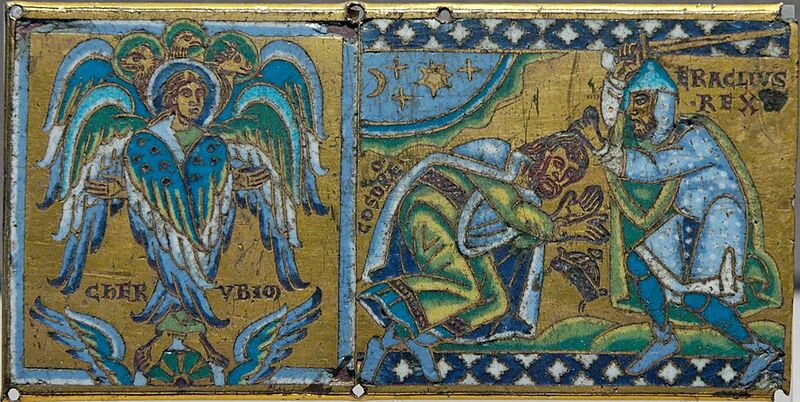 In 608, Heraclius the Elder, Heraclius´ father, renounced his loyalty to the Emperor Phocas. 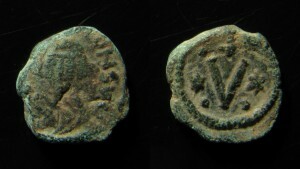 The rebels even issued coins showing both Heraclii dressed as consuls, though neither of them had claimed the imperial title. Phocas responded with executions, among them of the ex-Empress Constantina and her three daughters. Heraclius’ younger cousin Nicetas launched a successful overland invasion of Egypt, where he defeated Phocas´ army. While this invasion was taking place, the younger Heraclius sailed eastward through Sicily and Cyprus, planning to enter Constantinople. Some prominent Byzantine aristocrats came to meet Heraclius, and he arranged to be crowned and acclaimed as Emperor before even entering Constantinople. As he approached the city, and planned the attack, the Excubitors, the elite Imperial Guard, deserted to Heraclius, so he finally entered the city with very little resistance. 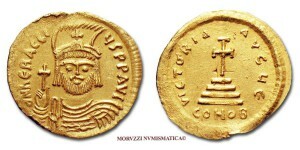 Enraged, Heraclius personally killed and beheaded Phocas on the spot. Phocas’s body was mutilated, paraded through the capital, and burned. On October 5, 610, Heraclius was crowned for a second time, this time in the Chapel of St. Stephen.